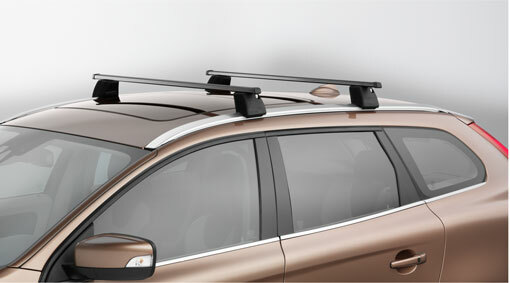 A practical transport system for loads on the car roof. The load carriers consist of two robust- galvanized and plastic covered steel profiles. The load carrier base is easily secured on the integrated rail profile with the help of the supplied torque wrench. An impact resistant- black plastic cover encloses the base while a rubber grip around the rail profile prevents marking. Assembly kit with front and rear load carriers including torque wrench. All load carrier accessories fit. A practical transport system for loads on the car roof. The load carriers consist of two robust galvanized and plastic covered steel profiles. The load carrier base is easily secured on the integrated rail profile with the help of the supplied torque wrench. An impact resistant black plastic cover encloses the base while a rubber grip around the rail profile prevents marking. Note! The load carrier should not be mounted on the roof when not in use due to increased fuel consumption and wind noise.